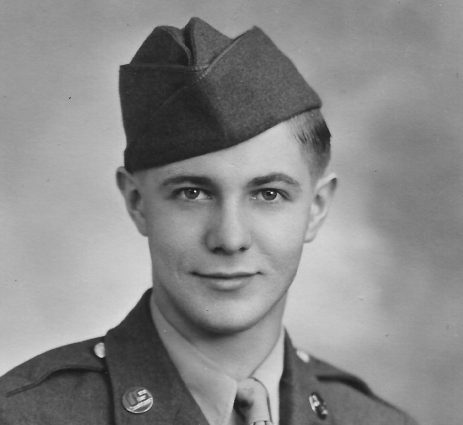 As far as I can tell, he joined the United States Army on April 19, 1944. According to a letter he wrote in April 1946, he talked about it being near his two-year anniversary in the Army. From then until about December, he probably went through basic training. There is some mention of Fort Sheridan, Illinois and Camp Shelby in Mississippi. Based on a receipt that he kept from his mother, he was located at Camp Shelby, Mississippi on this date as she looks to be sending him something. He mentions in a later letter that he spent Christmas in 1944 on a ship traveling overseas to Europe. At this time, he was stationed in England. The map mentions stops in Liverpool, Burton-Upon-Trent and Southampton. He mentions in a later letter that at this point he was promoted to Private First Class (PFC). Somewhere around here, he was put into the Ninth United States Army, as a member of the 748th Field Artillery Battalion. According to a few pages I found during Google searches, this battalion probably handled the 8-inch Howitzer guns. 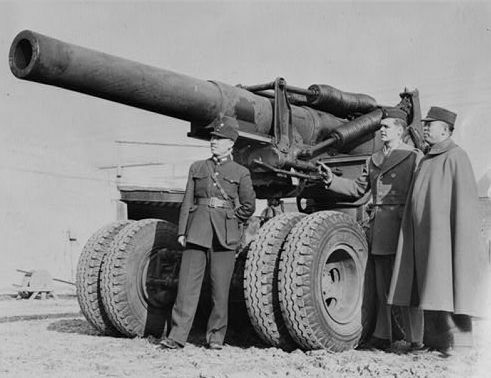 In a letter, he talks about the power of the artillery in his battalion. It was the first time we had gone through an area we had shelled with our own guns, so we really saw what they could do. There were hardly and buildings, with even just one wall still standing, in that area within the first few miles on the other side of the river. Everything was just a heap of rubble; buildings, german guns and equipment, and trucks, everything, just one heap. “Hank”, “Cheety”, and LeRoy Thielke. Taken in Burton, England, our last Sunday in England. February 1945. From Southampton in England, they traveled across the English Channel to Le Havre and then stopped in Dieppe, France. On their way to a stop in Charleroi, Belgium, they traveled through Abbeville and Douai in France and Mons in Belgium. Before making his way to Neuss, Germany, the battalion traveled through Namur and Liege in Belgium as they crossed into the Netherlands, making a stop in Roermond. Once they crossed into Germany itself, they passed through Mönchengladbach (or München-Gladbach at the time). By this time, and according to the Wikipedia article on the Western Allied invasion of Germany, this part of the invasion was the called the Encirclement of the Ruhr where Allied forces pushed German forces out of the area. This is the first mention of possible combat my grandfather may have been involved in, though more than likely there was some on the way to this area from Belgium. His unit had made it’s way to what he had written as Linfort, but I assume is Kamp-Lintfort, Germany, just north of Neuss, passing through Krefeld. This was still during the time of the clearing of the Ruhr Pocket in the area. They made their way east into Germany, passing through many towns and making a few loops before stopping in Kamen, Germany, just northeast of Dortmund. Their path through to Kamen means he crossed the Rhine River at Wesel since the last noted dates, a major marker in the Western Allied Invasion of Germany. From there they made stops in Dülmen, Ahlen, Beckum, Oelde, Soest, Werl, and Unna. His battalion makes their way east from Kamen through Bramey (Bönen), then back through Werl and Soest before continuing east through Geseke, Paderborn, and Horn-Bad Meinberg. They make a stop in Gronau (Lower Saxony), Germany. They cross over the Weser River, which runs between Horn-Bad Meinberg and Gronau. He is listed during this period to be in Dotson, Germany, but I can’t find this place on a current map. On the illustrated map I have for the 748th, Dotson is drawn just south of Magdeburg. It is mentioned in a later letter that on or around April 23, 1945, he was located near the Elbe River a few miles south of Magdeburg, Germany. 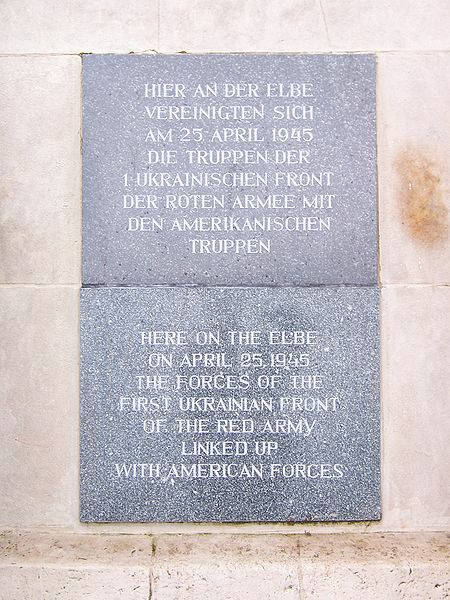 On April 25th, just south of this point, in Torgau, Germany, is where the United States Army met the advancing Russian Army on what is know as Elbe Day. Here is what he wrote about it in a letter to his parents. We had reached the Elbe River approximately two weeks before the official end of the war. Maybe it was longer than that, I don’t remember exactly. This was at the time that I told you I was sleeping in a barn in a straw mow. For the first few days we fired some, just to keep the “jersies” busy while we waited for the Russians to arrive from the other direction. This was a few miles south of Magdeburg. And then the Russians arrived, it wasn’t official, but we knew they were close because we had orders to hold fire, and there could be only one reason, just so we wouldn’t fire into the Russian troops. During this time, it’s mentioned that he was now located in Nindorf, Germany, which I assume is the one near Bergen, Germany. So, they had moved back north. According to his map, they traveled up through Magdeburg and took a turn north in Braunschweig. From there they ventured through Gifhorn, Groß Oesingen (also Gross Oesingen) and Uelzen before hitting Nindorf. Here is an excerpt from a letter he wrote about this time. We got orders to cancel that “polished soldier job,” we were moving out in the morning. The British needed help and our outfit, the 748th, was one of the first to give it to them. We were told that this was “it.” This would be our toughest assignment yet. And boy, I guess you know just how we felt, especially after having the war over just the day before. We moved out that day, traveling through Magdeburg, and on to the outskirts of a small town between the city of Bremen and Hamburg, just several miles of the south-west side of the Elbe River. That was the area where I said I was sleeping in a tent out in the woods. We were in on the spearhead with the British 18 airborne [ed: more than likely the 6th British Airborne Division or American XVIII Airborne Corps]. Other American artillery moved in right after us, and there was plenty of it. Heavy and light stuff. We didn’t fire much the first night, but the next couple days and nights we really laid in a barrage on enemy territory on the other side of the river. Then, he talks about the large number of surrendering German soldiers as they moved. That is one day none of us will ever forget. We moved on, right behind the armor spearhead. Germans were surrendering, by just getting on the road and heading south. At first there were only small groups of them but as we went on the numbers grew. There wasn’t any of the resistance we had expected. We had to stop and wait many times that day to let the tanks get a few miles ahead of us again. We went on all that day that way, always heading north. By that time the Germans were surrendering by the thousands. We would meet whole convoys of German trucks headed south. They were flying the white flags of surrender. Thousands walked, or rode bicycles or on wagons, any way or means of transportation. They all came of their own accord, without any guards. Many of the soldiers had their wives and children with them. When they got further into American territory they were herded into P.W. corrals. He is now listed as being located in Bobitz, Germany just south of Wismar, Germany. From Nindorf, they traveled through Wittenburg and Lutzow to get here. This is quite near the Baltic Sea in northern Germany. It’s actually not too far from where his ancestors were supposed to be from in Schwerin, Germany. It is mentioned on Wismar’s Wikipedia page that “at the end of the war in Europe, as the line of contact between Soviet and other Allied armies formed, Wismar was captured by the British 6th Airborne Division on May 2, 1945.” Again, he talks about the surrendering German soldiers and mentions how young and old some of them were. The Russians were coming to meet us once again, and as they came closer, more and more Jersies came out of “hiding.” For the next couple of days the roads were filled with an endless mass of German soldiers. Hour after hour they trudged by. Many were only “kids.” We would stop some of them once in awhile to ask how old they were. And there were a few as young as thirteen or less even. They said they were in the army only several days. They had been given a rifle and ammunition and ordered to fight. And then many of them were on the other extreme. Old, gray haired men that were so feeble they could hardly keep up. After helping the British and American troops, they head back south through Lutzow, Wittenburg, Nindorf, and Uelzen before stopping in Groß Oesingen (also Gross Oesingen) which is somewhat near where he was a month or two earlier. They make a long trek back to south toward Leipzig, Germany, traveling back through familiar territory including Gifhorn and Braunschweig. He is located in or around Nuremberg, Germany or Schwabach, Germany (just south of Nuremberg) during this time. He notes in a later letter that on June 6th in Nuremberg that he was transferred to the Third Army. Third Army. 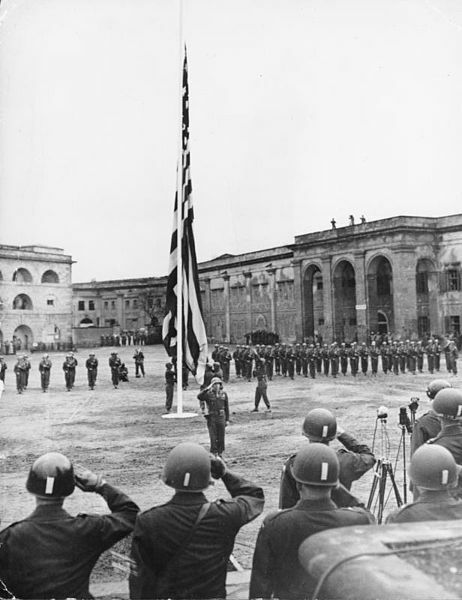 American flag of last occupation reraised at Coblenz. 1945. For these 20 days, he notes being located in Weissenburg which is actually named Weißenburg in Bayern, Germany. For these few months, he travels back west and spends time in Paris, France. He sends many letters during this time talking about how well off he is compared to his time in Germany. On September 28th, he is transferred to the Headquarters Company of the Quartermasters Corp and moved to a location a block off of the famous Paris street, Champs-Élysées, not far from the Arc de Triomphe. 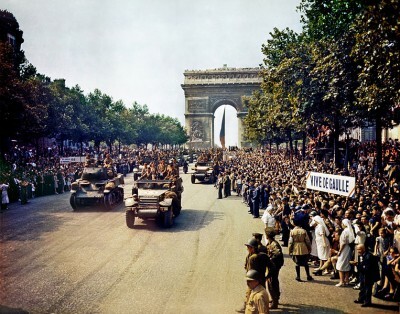 Crowds of French patriots line the Champs Elysees to view Free French tanks and half tracks of General Leclerc’s 2nd Armored Division passes through the Arc du Triomphe, after Paris was liberated on August 26, 1944. 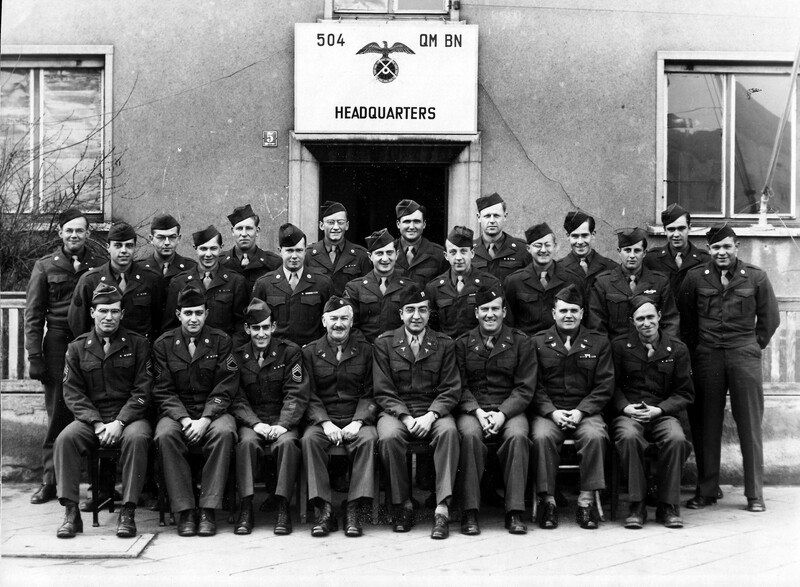 During this time, my grandfather was stationed in Mannheim, Germany with the 504th Quartermasters Battalion. It seemed to be a much calmer time, as he mentions in a lot of letters that it can sometimes get boring as there is not a lot to do during their downtime. He sees movies almost every day, though he talks highly of the “chow” that they get to eat. Sometime in November 1945, his battalion took this photo in Mannheim. He is the second from the left in the second row. Click for a larger version. On a side note, on December 9th, 1945, General George S Patton gets into a car accident in Mannheim which results in his death a few weeks later. My grandfather didn’t mention it in any letters, though. 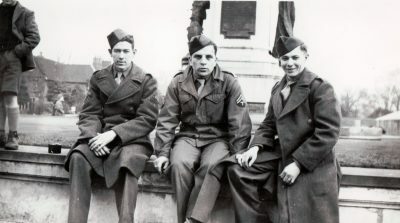 On December 21st, 1945, he goes on his first furlough for about ten days in Switzerland. 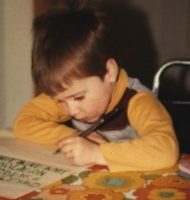 He writes a letter from the Swiss Leave Center at Mulhouse, France. On January 16th, 1946, he gets a promotion to Technician Fifth Grade (T/5). Those who held this rank would be addressed as Corporal. He goes on another furlough on March 15th, 1946, due to a few other soldiers deciding not to go. He is in Switzerland again until about March 23rd, 1946. During this time, on about March 22nd, 1946, he receives another promotion. This time he is promoted to Sergeant (Technician Fourth Grade). Again, on April 15th, 1946, he is promoted to Staff Sergeant. Sometime ago, I figured that the time would start to drag as my time over here became shorter, closer to the time I would start for the states. Well so far, it is still flying along as it has for the past few months. But then there have been a lot of nice things happening that make each new week a little different and interesting. Such as my furloughs, my several promotions, a better job, a radio in my room, and many little and big things like that to make a change in things every so often, to break the monotony. The last letter I have of his is on May 19th, 1946 from Mannheim. Based on a newspaper he has from June 12th, 1946 called the “The Waterbury Wanderer” he was located at 40°49’N 57°39’W on the SS Waterbury. He was traveling back home with 750 more miles to go. I will probably update this post as I find new information. I will list the updates down here in this section and probably do a quick post to let people know about it. 11/18/2013 – Remembered that I had photos of an illustrated map my grandpa had showing the path of the 748th. Updated a few entries to show their path to the major stops. 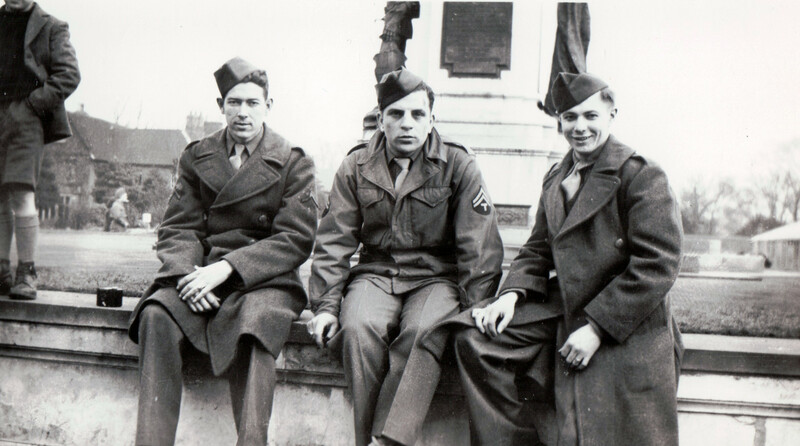 11/26/2013 – Added a new photo from England in February 1945. 11/10/2014 – Fixed some incorrect locations. Added Google Map version link. 10/19/2016 – Added an entry for 12 June 1944. 10/25/2016 – Added entry for 12 June 1946.